Something For Our Local NWS Offices To Think About. 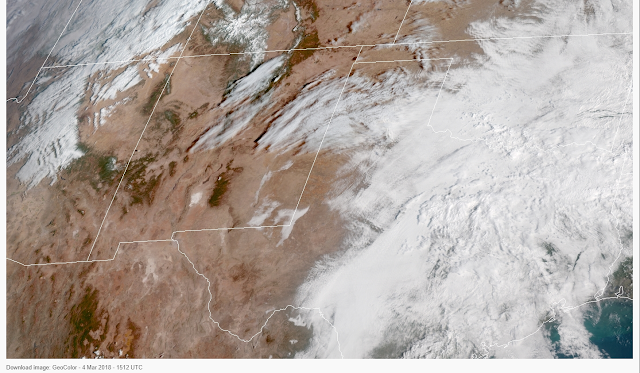 GOES-16 Visible Satellite Image At 8:12 AM MST This Morning. Dense fog formed this morning in the Pecos Valley of Southeastern New Mexico. Looking at the visible image of the satellite screenshot above it appears that fog may have also formed in the very southeastern corner of New Mexico in the Eunice and Jal areas of Lea County. The dryline backed westward overnight and low level southeasterly upslope flow from the Gulf of Mexico imported higher dew points and moisture into the local area. 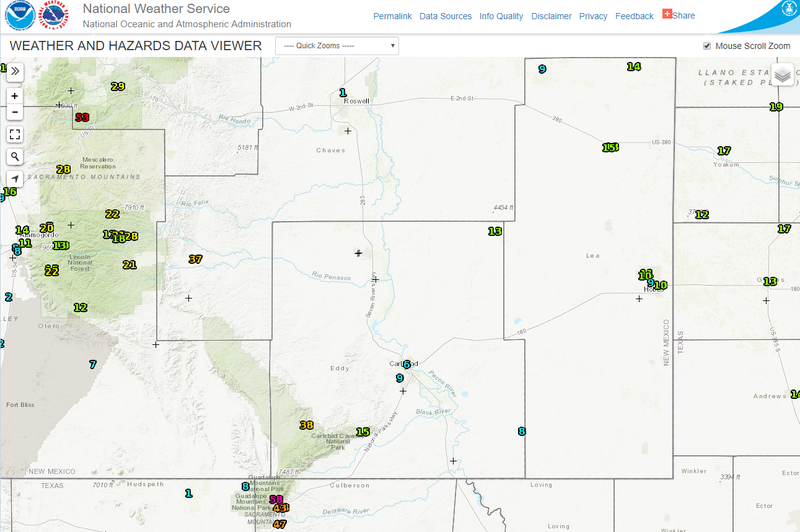 Artesia, New Mexico Airport AWOS Observations. 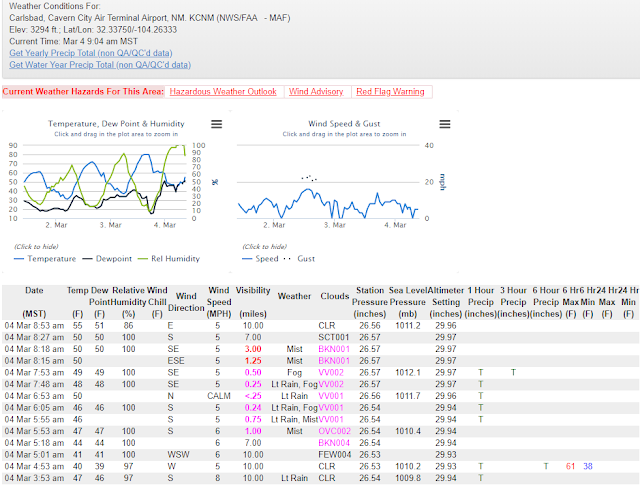 Carlsbad, New Mexico Airport ASOS Observations. 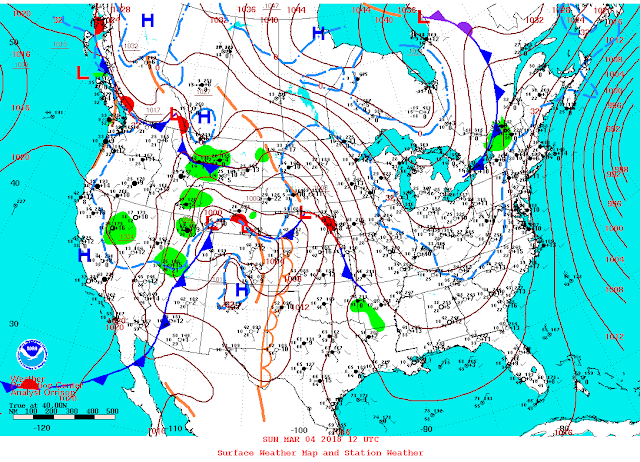 NWS MesoWest Current Weather At 8 AM MST. Or Difference Between The Temperature And Dew Point Temperature. Relative Humidity Values In %. 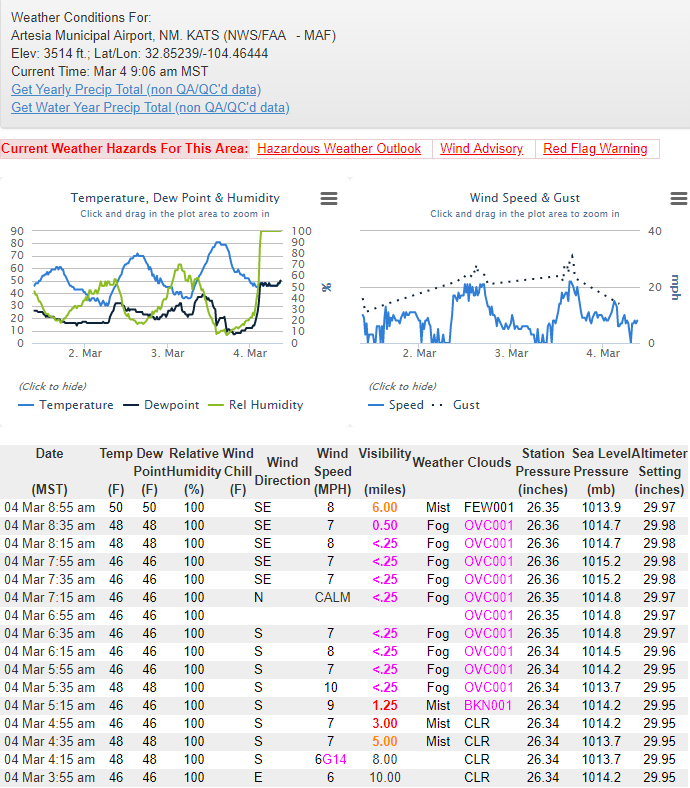 Notice that the relative humidity values in both Artesia and Carlsbad at 8 AM MST this Sunday morning was 100%. So the dew point temperature depressions were both at 0. The dew point temperature depression is the difference between the temperature and the dew point. The dew point temperatures were the same as the air temperature which produces a relative humidity value of 100%. At 8 AM MST the temperature at the Dunken Raws (5,431') located west of Artesia (3,514') on the east slopes of the Sacramento Mountains reported a temperature of 58ºF, a dew point temperature of -3ºF, a dew point depression of 61ºF, and a relative humidity value of 8%. Obviously very dry air and the dryliine with the higher humidities and dew point temperatures had not worked that far west. 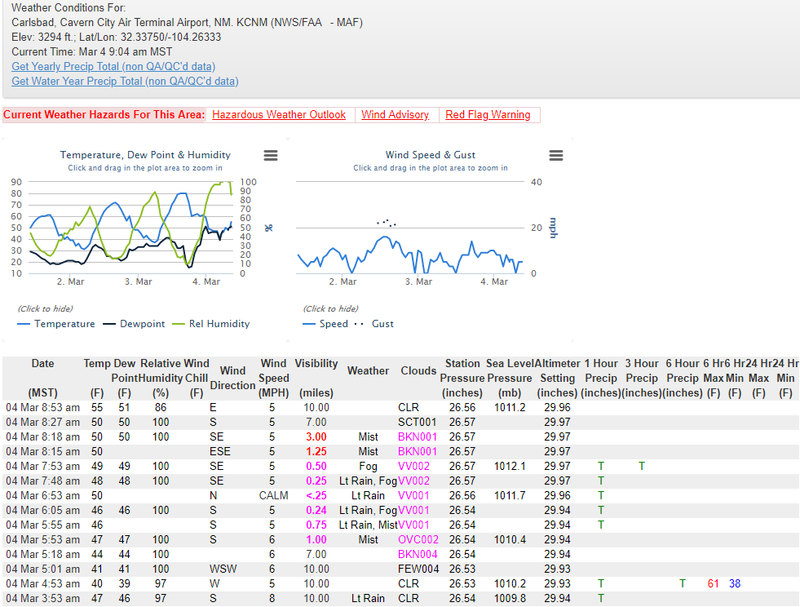 We know this also by the fact that a west wind was gusting up to 37 mph at the time. Downsloping was occurring meaning that the air or wind was moving down the east face of the Sacramento Mountains and warming and drying out as it did so. 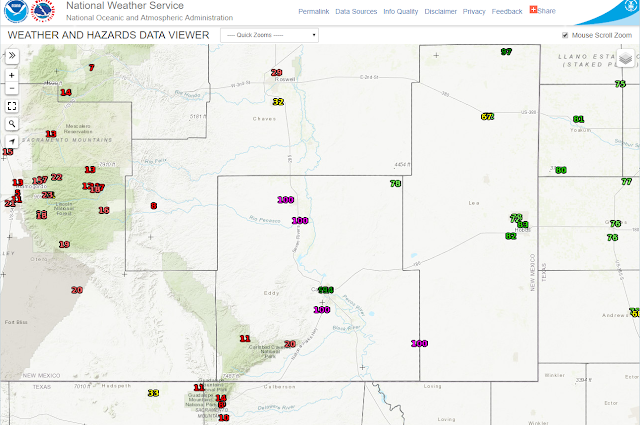 An even more extreme case of what was happening in the Pecos Valley this morning can be seen by the differences in the observations at the Carlsbad Airport (3,294') and the Bat Draw Raws (4,425') located 16 miles to the south-southwest. So the difference in elevation between the two stations is only 1,131'. By the way a more extreme example of elevation change within a short distance is the example of Cloudcroft (8,750') and Alamogordo (4,336') with a difference of 4,414' within 16 miles. Anyway at 8 AM MST this morning the Carlsbad Airport ASOS was reporting a temperature of 50ºF, a dew point temperature of 50ºF, a dew point temperature depression of 0ºF, and a relative humidity value of 100% with dense fog reducing the visibility down to 1/2 of a mile. A southeast wind was blowing at 5 mph. 16 miles to the south-southwest and 1,131' higher up the Bat Draw Raws was reporting a temperature of 66ºF, a dew point temperature of 24ºF, a dew point temperature depression of 42ºF, with a relative humidity value of 20% with a west wind gusting up to 15 mph. And 32 miles to the west-northwest as the crow flies the Queen Raws was reporting a temperature of 57ºF, a dew point temperature of 3ºF, with a dew point temperature depression of 54ºF, a relative humidity value of 11%. 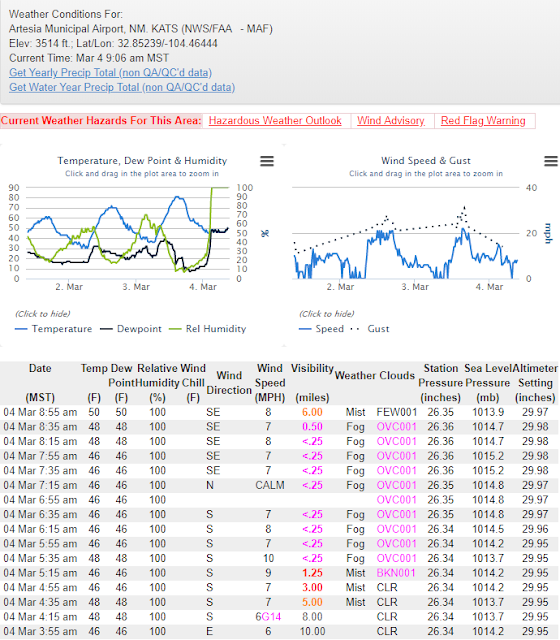 West winds were gusting to 38 mph at the time. Note also that westerly winds were gusting up to 47 mph at Guadalupe Pass and 58 mph at the Bowl Raws site just north of Guadalupe Peak. 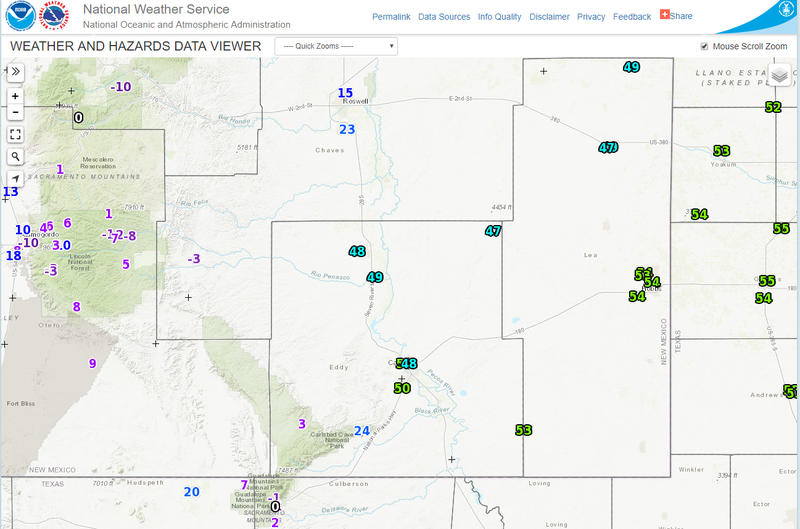 Stronger winds aloft had not yet mixed down to the surface in the Pecos Valley of Southeastern New Mexico as of 8 AM MST this morning, which would have had the effect of scouring out the fog. However by 9 AM MST this was beginning to occur as both the Artesia and Carlsbad Airport observations were showing a rapid and marked improvement in both the visibility and ceiling heights. What Was The Midland National Weather Service Office Thinking? What I don't get or understand is why a Dense Fog Advisory wasn't issued for Eddy County by the Midland NWS Office? Nor was the local forecast for Artesia and Carlsbad ever amended or updated to reflect the current conditions, or the mention of fog, even though it was dense at that. Nor was there a simple Special Weather Statement issued by this office to cover these conditions! Nothing was issued via Facebook or Twitter by this office either. I'm normally not one to criticize our local National Weather Service Offices concerning their local forecasts and such. I fully support these offices and their efforts to serve the public locally. I've proven this over the past forty five years with my dedication to their Skywarn Program and my storm chasing. I also realize that this was a highly localized event of short duration. But to make no effort whatsoever to deal with this situation was inexcusable and unacceptable in my humble opinion! Here is something that perhaps our local National Weather Service Personnel may want to consider. Given the recent boom in the oil field over the past few years we have undergone a population explosion here in Southeastern New Mexico. Specifically in the Carlsbad and nearby areas. Our local population reportedly has grown from about 24,000 to 75,000 in the past couple of years with projections to go over 100,000 soon. That's just in Carlsbad. Similar conditions have occurred in our nearby communities. Not only is the local oil field population exploding so to speak but these people are traveling up and down our local roadways on their days off. This includes the Guadalupe, Sacramento, and Capitan Mountains. There also is much more traffic going to and coming from our nearby sister cities such as Midland/Odessa, El Paso, Lubbock, Roswell, Ruidoso, Cloudcroft, Hobbs, Pecos, and Fort Stockton. Even travel to and from the biggest cities of Dallas/Fort Worth, San Antono, and Houston has increased. More people are going shopping, out to eat, to see a movie, visiting relatives and friends. More people are out and about trying to get away from the crowds. They are taking day trips going hiking and camping or gambling or whatever. More people live here now than they did five years ago...many many more. The oil field in rural Southeastern New Mexico and parts of West Texas is literally crawling with thousands of workers now. They work around the clock, twenty four hours a day, seven days a week. Rural areas that in the past were seldom visited by other than an isolated rancher or dove hunter, or anyone at all, now are buzzing with all kinds of oil field related activity and personnel. Traffic conditions on our local highways in most of Southeastern New Mexico and parts of West Texas are horrendous at best on good days without bad weather in many areas. This is due to the massive overcrowding and congestion on our local roadways, the bad physical conditions of our local roadways, and the risky and dangerous driving habits of some of these drivers. The number of fatalities due to vehicle accidents has increased at an alarming rate. Wrecks on our local roadways with injuries or not also is alarming. Its bad enough trying to navigate our local roadways given a normal non eventual weather day, but when the weather is bad its frightening and sometimes terrifying to say the least. A Suggestion For Our National Weather Service Offices. 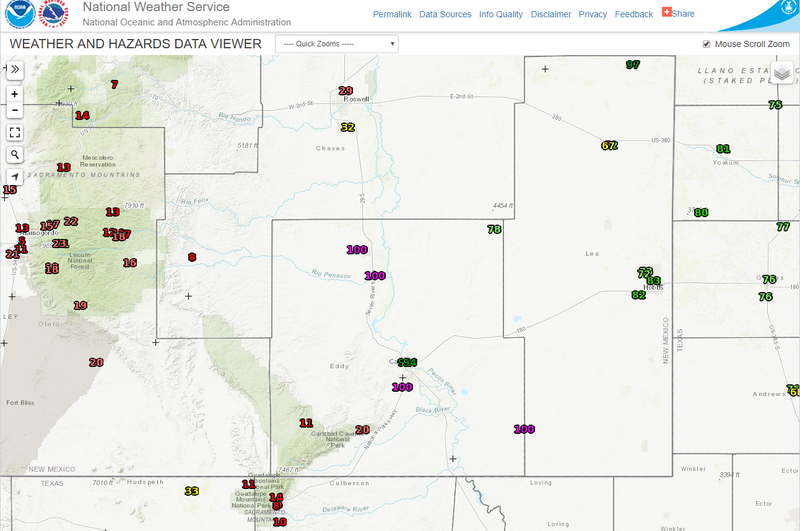 Perhaps a little more attention needs to be given to localized weather conditions such as this mornings dense fog event by our local forecasters (in the Midland, Albuquerque, and El Paso/Santa Teresa National Weather Service Offices). The implications and ramifications of something bad happening on our local highways during bad or inclement weather has increased dramatically with the local changes and our population explosion. The conditions have changed in Southeastern New Mexico and nearby West Texas. We are not as sparsely isolated and populated as we were a few years ago. This is forecast to only get worse with time as more and more people move into the local area seeking the better paying jobs that available. Given the sudden and dramatic increase in our local population I also believe that better localized attention is needed during severe weather outbreaks as well. This includes during tornadoes, severe thunderstorms, flash flood events, high wind and blowing dust events, and winter storms. Our local conditions have changed. So perhaps your efforts to better serve our local needs and conditions should also.